This entry was posted in Uncategorized and tagged Bagel, breakfast, cooking, food, Ham by christao408. Bookmark the permalink. You treat yourself very well. Keep of the good work and watchout for those calories. I love anything on a bagel. haha There’s something about a bagel that I love. I love the way your coffee cup is filled to the brim. I bet that smells good. I too like bagels. Haven’t had one in a long time. Looks very tasty but low cholestrol it isn’t! No cheese for me – no eggs either. *pout* I will be waiting anxiously for the next post! Hearty breakfast! I love bagels. Sounds good. I wonder if bagels taste similar to another type of bread. 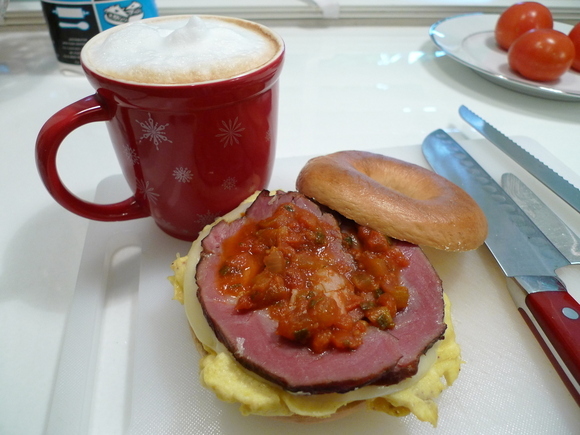 Your bagel sandwich surely looks yummy and what a marvelous breakfast to start the day! Soul Food. How did they come up with that name…? I’ve never tried salsa with ham or eggs before. How was the ham? an awesome 1000 calories not for us who constantly struggle with weight gain but mouth watering non the less. @christao408 – Yes, only a good bagel. haha None of those rock hard bagels.